Photography is the art and craft of capturing light, whether via silver halide chemistry on film, or via silicon on a sensor array. “Capturing light” is probably the key part of this definition: unlike the popular perception that we photograph people or things, it is impossible to actually render anything in the absence of light. All we can capture is light emitted or reflected (mostly reflected) by our photographic subject matter. Why do we care about a photo? Generally because it stirs our emotions. Emotions can be stirred for many reasons, and due to many associations (Marcel Proust’s account of emotional reminiscence stirred by an odor comes to mind). An emotionally resonant image that is technically imperfect will trump a technically perfect but banal image any time. If you want to be a better photographer, train yourself to see light and not objects. Light inspires, directs and misdirects when it is captured as the incredible force it is. Use all of this in your work: the force, the power, the inspiration, the direction and the misdirection. Uniform and moderate light is rarely as interesting as strong lighting. Think of it this way: without evil for comparison, how do we know what “good” is? Light is the same way. You often can’t really see it unless there is also darkness. 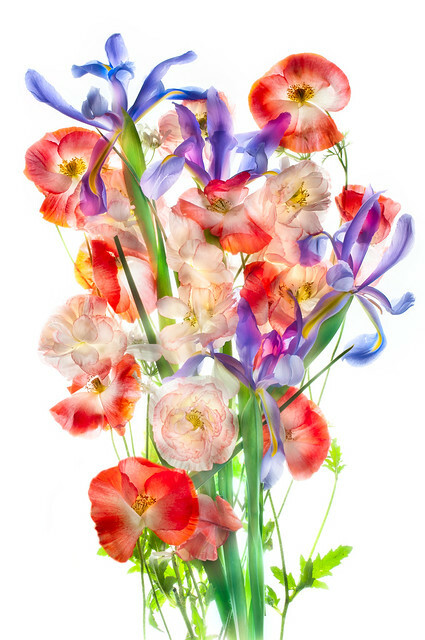 In my high-key image of Irises in a Vase (shown far above) I purposely created a highly artificial construct of light that seems almost blinding—and therefore obscures details. This image does not look the way it would be rendered in a single accurate capture, but is more emotionally compelling because the apparently overwhelming light has left only the painterly details, with enough visual clues for the viewer to interpolate the rest. With Boathouse Still Life (above) the emotional appeal is achieved because of the partial illumination. In a generally low-key image, the composition with nautical rope behind it is lit by an apparently momentary shaft of light. In Story of O (above) the action is in the gradation of light, from the light gray in the distance to the darker gray in the foreground, and the contrast with the black outlined shape. A sense of mystery always adds to the emotional appeal of an image, and the relationship of the background gradient to the “circle” foreground is indeed mysterious, bringing several different kinds of light into play. I like to quote the American poet Randall Jarrell, who once said that “Art being bartender is never drunk.” I take this to mean that my viewers don’t have to know what is going on in an image, and maybe even shouldn’t—but as “bartender” I must. 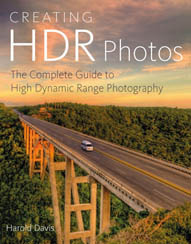 This means first and foremost learning to use and control the emotional impact of light in my imagery. Related stories: More about Story of O; more about Boathouse Still Life. 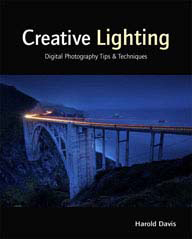 Also check out Becoming a More Creative Photographer (a set of articles with exercises on Photo.net). 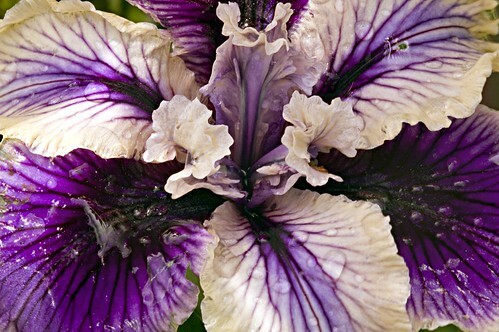 These variegated iris are clearly friends. They look at each other with empathy, tendrils even apparently touching—or at least waving to each other! I’ve learned to listen to that inner voice when I do hear it, and to cultivate it. I miss my inner voice when it is absent! But inspiration can be a demanding mistress. Life in a household with four young kids and two working parents is full of good reasons for denying my inner voice. I’ve work to do, images to license, books to write, bills to pay, kids to pick up! Life must go on! But it is only by giving our inner voices some time and space to work their magic that we become the people—and artists—that we were meant to be. Walking the boys to the school bus stop I passed a clump of white irises growing wild in the strip between the sidewalk and the street. 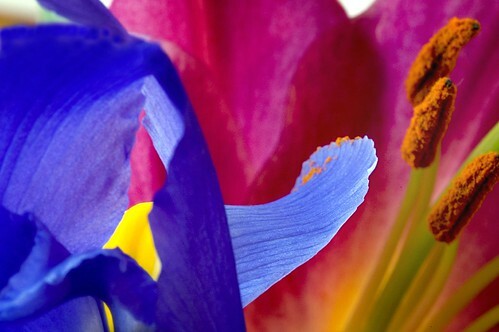 The irises called out to me, try as I might I could not ignore them. After waving kisses to the boys when they got on the bus I walked home, got my pruning shears, and found my way back to the irises. 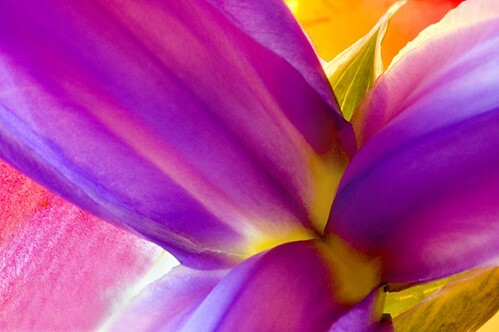 I laid the flowers out on my lightbox, fanning out the foliage, and shot straight down. The result you see is seven exposures at shutter speeds from 1/60 of a second to 1 second, all shot with a macro lens at f/10 and ISO 100. I combined the seven exposures using hand-HDR in Photoshop and Nik Software’s HDR Efex Pro. A background made in Photoshop from scanned paper was then added to complete the composition, giving the image a touch of an old-fashioned botanical look: old and new combined in an unusual way. 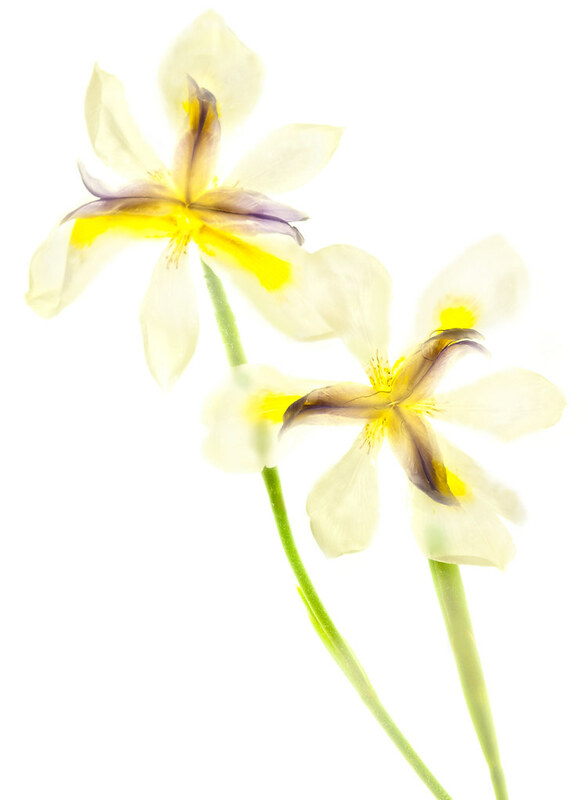 Here’s another floral image, this one in a much more classical style than Floral Impressionismo. I lit the white Iris from left and right, using diffuse sunlight controlled via shades and blinds. I added black foam core board to cut out any unsightly highlights. The fancy lighting term for this arrangement is that these boards were used as “Gobos”—meaning they go between the light and the subject. Using my 85mm macro, I shot six exposures with the camera fixed on a tripod. Each exposure was at f/64 and ISO 100, with shutter speeds ranging between 1/2 a second and 20 seconds. 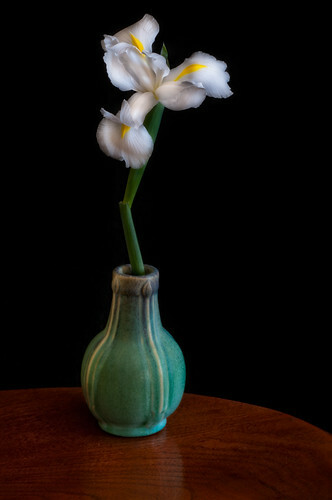 In Photoshop, I used the 1/2 second exposure for the background, the 4 second exposure for the table and vase and much of the flower, and the 10 and 20 second exposures for a few highlights. 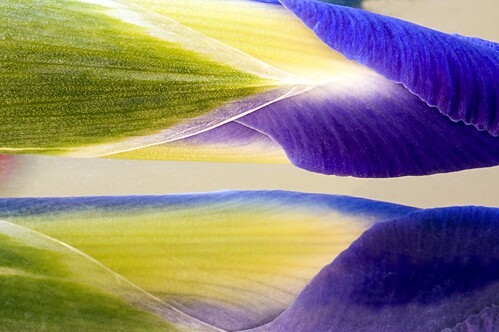 Since I was setup and enjoying photographing flowers on a white background, I decided to add these partially transparent white Iris to the mix. 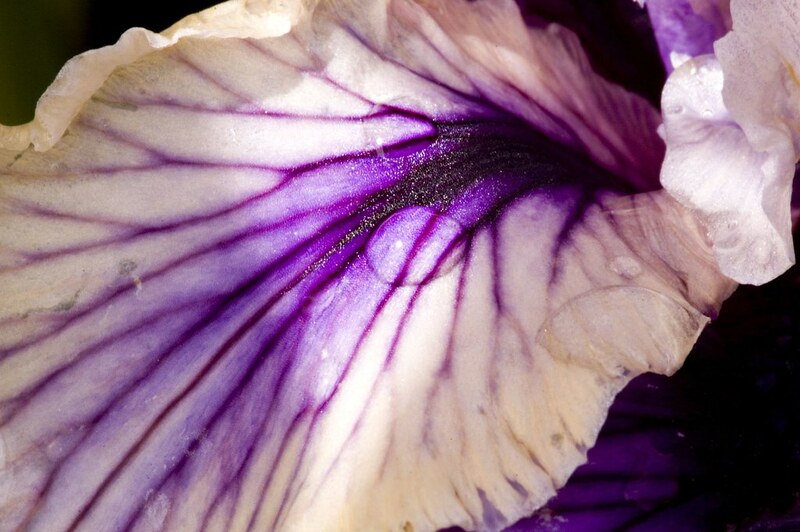 Well, I probably will never get bored with photographing Irises and other flowers, but I can take a hint. (OK, not a hint, but a big, fat nudge.) 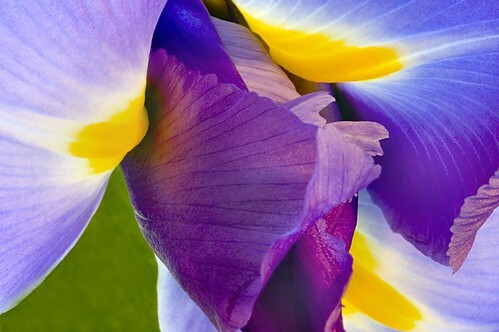 Also, maybe I am reaching a point of iris overload. 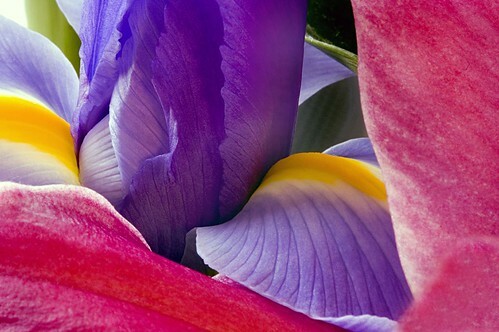 If you really don’t want to see flowers, instead of looking at these Iris photos, you can always look at my stories about my recent awesome roadtrip instead of these! 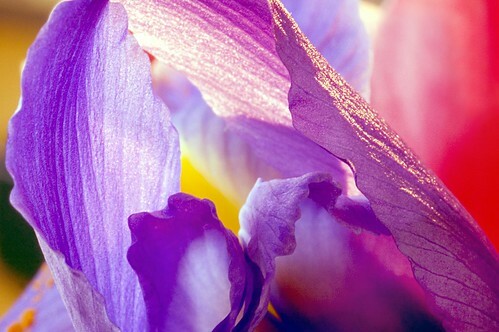 More of my Iris photos here, here, and here! 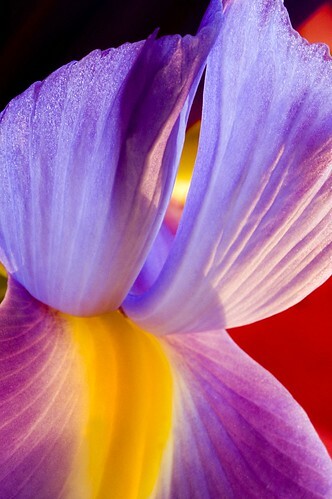 Winged Iris, photo by Harold Davis. Irises here, there, and everywhere. 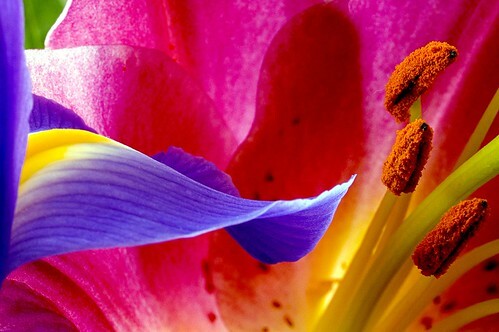 I am enjoying photographing this very special flower, it is one of my favorites. 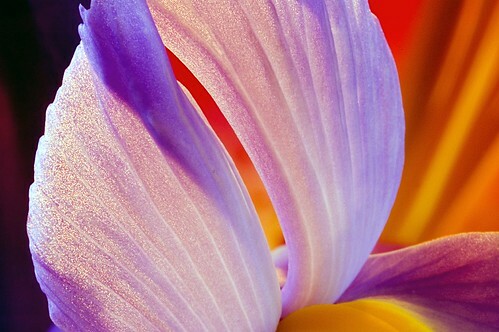 The Iris petals in this photo remind me of wings. Very appropriate. 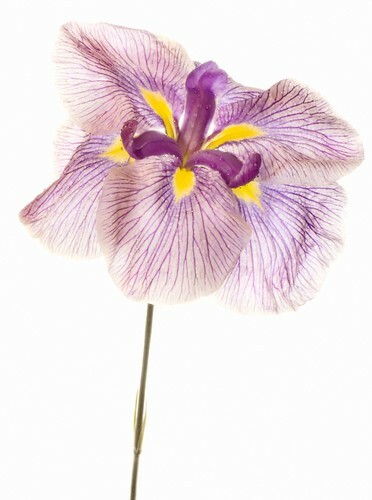 In Greek mythology, Iris was a winged messenger for the gods. 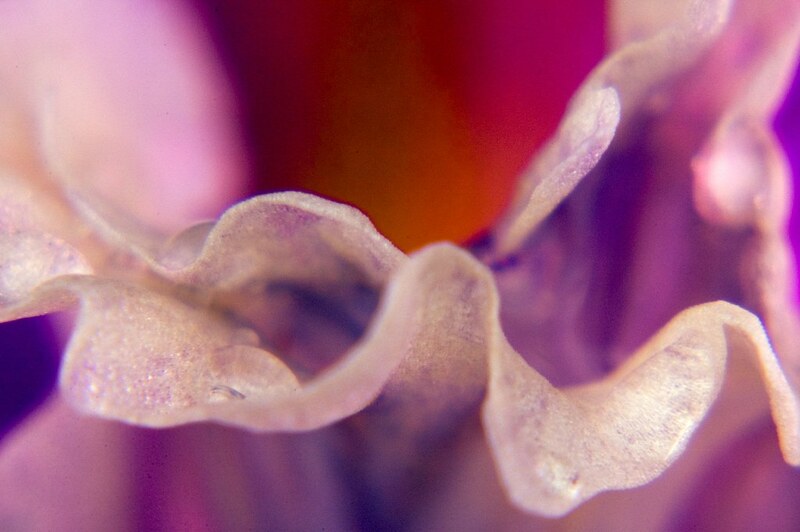 Iris Tongue, photo by Harold Davis. 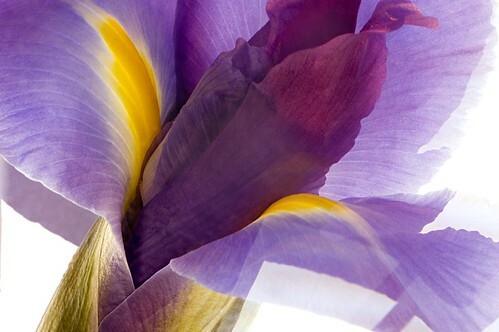 I am continuing to photograph the irises today. 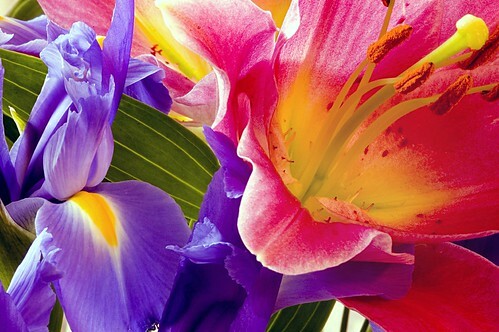 They are so beautiful, and look good when positioned with a red lily for background color. This one reminds me of a tongue. 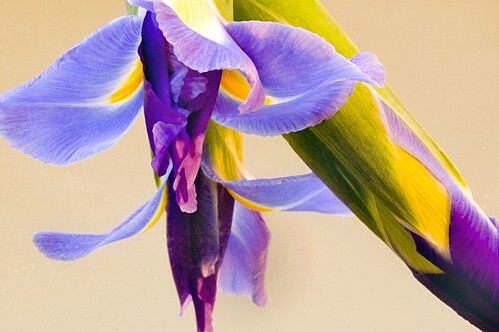 Is this attractive Iris sticking out a tongue at us? 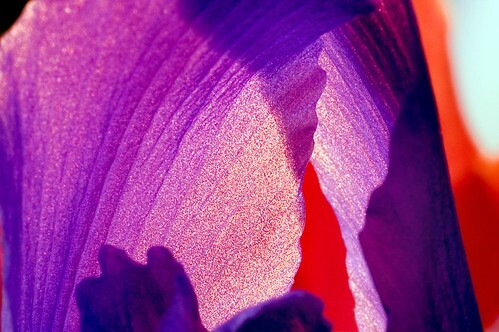 Whale Song of the Iris, photo by Harold Davis.